Take a step back in time on our Historical Walking Tours! The Historical Society of Palm Beach County hosts monthly Downtown West Palm Beach History Strolls led by architect and historian Rick Gonzalez of REG Architects. The one-hour guided tour showcases the evolution of downtown West Palm Beach buildings and landmarks and includes a historical urban design overview through recent area development. 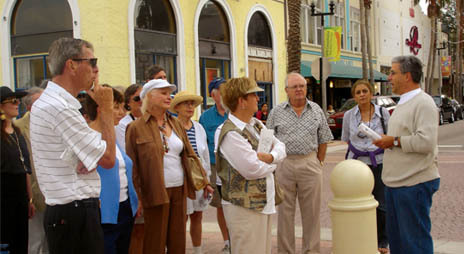 The tours have been organized each season since the development of CityPlace in West Palm Beach. Friday tour participants meet on the second floor of the historic 1916 Courthouse in West Palm Beach. Tours begin at 4 pm and are $10 per person. Call 561.832.4164 ext. 100 for more information or purchase your ticket and reserve your spot. Walking tours are rain or shine. Refunds will only be given if tour is canceled because the minimum number of reservations is not met. Explore downtown WPB’s history during an interactive Walking History Tour on the first and third Saturday, October through April! In partnership with the City of West Palm Beach Green Market, the 90-minute guided tour will be led by architect and historian Rick Gonzalez. The tours will highlight the evolution of downtown West Palm Beach buildings and landmarks. Saturday tour participants meet “by the Banyan tree” on the north end of Clematis Street, 101 N. Clematis St., and end at the Richard and Pat Johnson Palm Beach County History Museum, at 300 N. Dixie Hwy. Tours begin at 10 a.m. and are $10 per person. Call 561.832.4164 ext. 100 for more information or purchase your ticket and reserve your spot. Walking tours are rain or shine. Refunds will only be given if tour is canceled because the minimum number of reservations is not met..